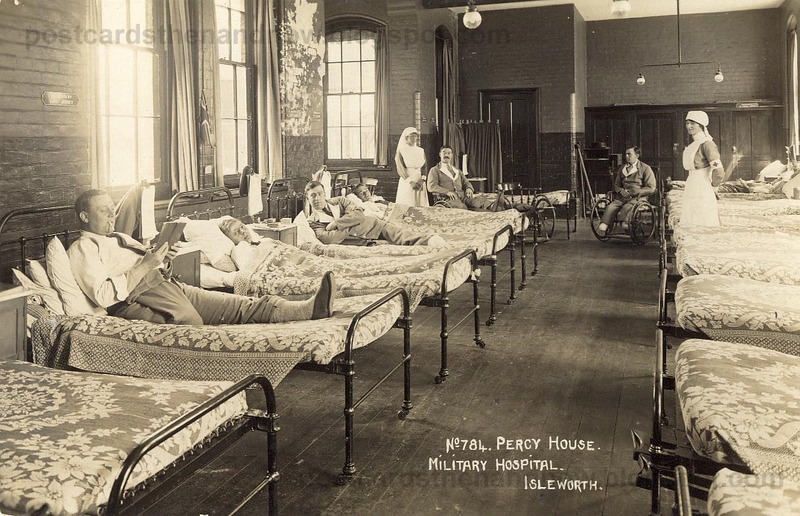 Isleworth, Middlesex, Percy House Auxiliary Hospital, before and during the Great War. Percy House was a school that stood where part of the present West Middlesex Hospital now stands. From the Wikipedia article on Isleworth - 'Percy House Military Hospital - Within the old union workhouse complex stood a school, facing Twickenham Road, called Percy House - Percy being the surname of the Duke of Northumberland. Owing to its gradual disuse as a school it was adapted to function as a military hospital during World War I of 1914-18. From 1915 onwards it treated some 5,000 war-wounded soldiers, and then ceased operation some time after the war's end. The building was demolished in 1978'. 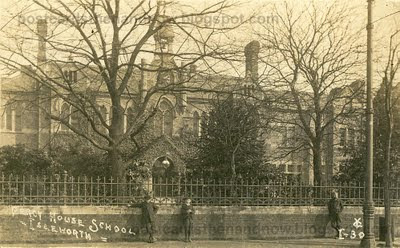 The first postcard, by Young & Co of Teddington, shows it as it originally was, a school in about 1911. 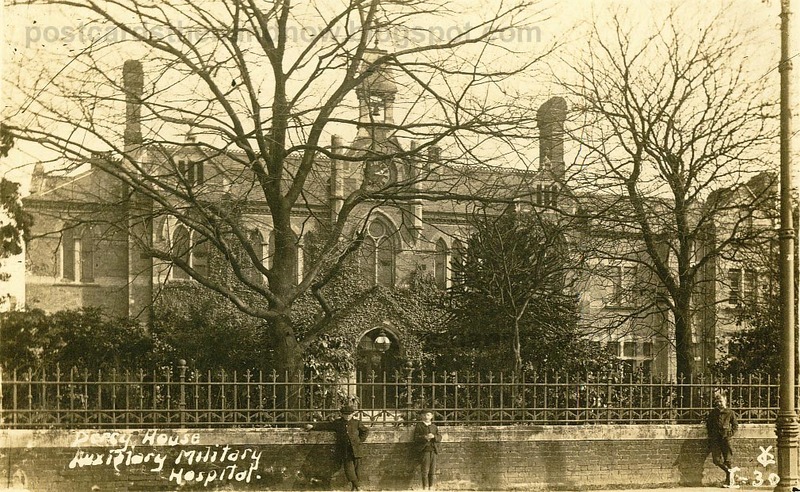 When it became a military hospital during the war Young simply removed his previous caption from the glass negative and replaced it with its new title as in the second postcard. The Google Street View, though unimpressive, shows approximately the same view today. 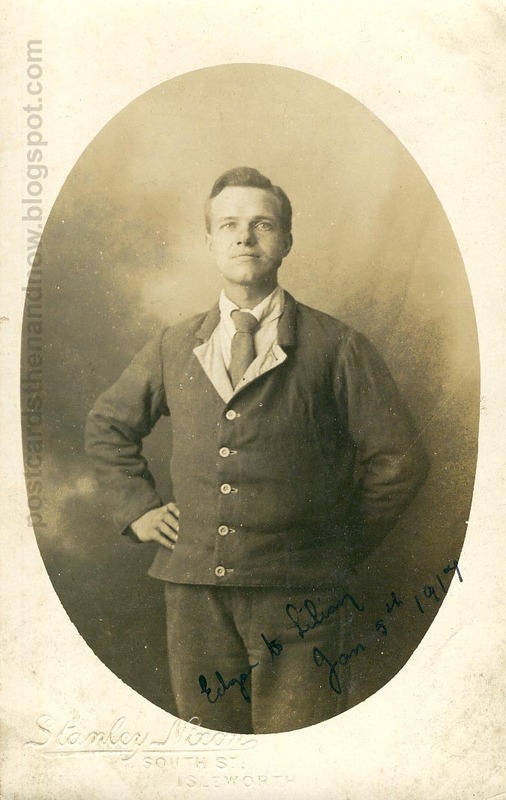 The third postcard shows a patient (or possibly medical orderly) of the hospital, Edgar Bleasdale, originally a cotton weaver from Padiham in Lancashire. The postcard is marked on the front 'To Lilian' and is dated January 5th, 1917. Edgar married a Lilian Stanworth in 1924, likely to be the same woman. 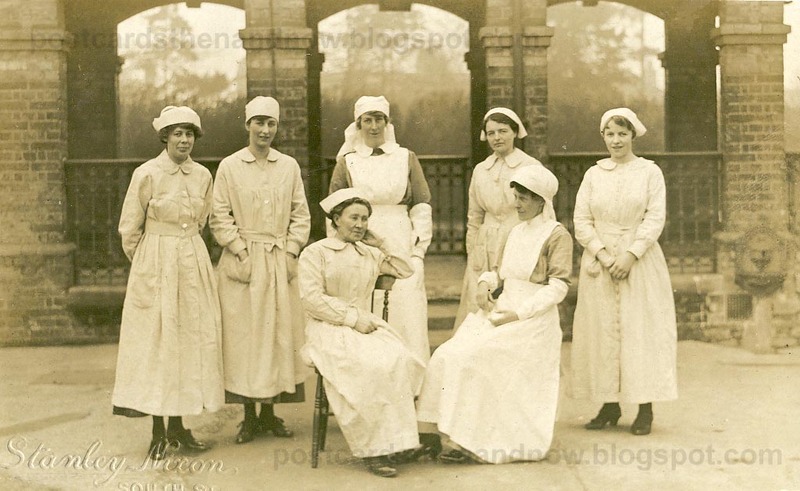 Next we see a group of nurses from the hospital. These two postcards were by Isleworth photographer Stanley Nixon. Finally, an interior shot of one the the wards. The patients look pretty cheerful, but their wounds are horrific. For more excellent old images please visit Sepia Saturday. Sad seeing all those men with one leg missing. wonderful postcards, it is criminal that such a beautiful building was demolished! 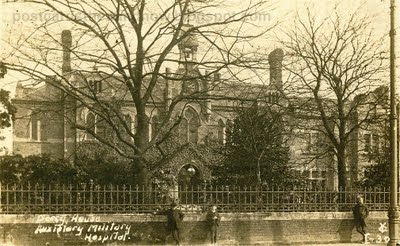 The postcard of the hospital ward is very moving, it must have been very difficult for people. Horrific injuries unfortunately matched today by those wounded in Iraq and Afghanistan. The Percys got around a lot; we live within 95 miles of Alnwick, the home of the family. This is a very interesting and moving set of pictures. The hospital looks very drab and in need of a coat of paint. No pictures or flowers to cheer the soldiers, who all appear to be amputees. I can see better detail here on those "hospital blues" the patients wore. At first I couldn't get over them having to wear suits and ties, but I see that it is probably comfortable knit material of some kind. But still... there's something to be said for PJ's. Excellent addition to today's theme! The man reading looks so nonchalant - as if nothings happened to him. Is tha t what you call the British stiff upper lip? We love you nurses! Oh yes we do! I am happy to say you have a photo with a man in Hospital Blues! 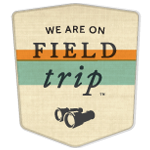 I just leanred through my Sepia travels...excellent post! This reminds me of during the Vietnam war when I'd go with my mother to the military hospital to see a doctor and we'd stop at the PX to buy things. Walking and rolling up and down the aisles were men in pajamas and bathrobes, all wounded soldiers. It always seemed a little surreal because then we'd drive off the base and you'd see no signs that the country was at war. Just in that little PX. That is an interesting collection of related postcards, especially the interior view of the hospital. Very interesting addition to the Sepia Sat theme. The clarity and extra detail in the photos really help preserve a less well known part of the war. Where did the tradition of the Hospital Blues start? The earlier wars of the 19th century? Are they similar to the naval hospital uniforms? I think it's nice that they had uniforms, rather than pajamas or hospital gowns. So much more dignified! A fascinating set of pictures.